Jai Zharotia was born in Delhi in 1945 to a family of Rajasthani artisans. Between 1967-71, he studied Fine Arts from the Delhi College of Art. Discovered in the early 1970s by Roshen Alkazi, he went on to exhibit at the Kunika Chemould Gallery, the Black Partridge Gallery, and eventually did his most important solo exhibitions at Art Heritage. He worked on educational projects for children at Bal Bhavan before becoming a lecturer at his Alma Mater in 1974, from where he retired as Professor and Head of the Painting Department in 2005. As a teacher, Zharotia made it a point to work in the college for the benefit of the students. An artist who has never hesitated to experiment with both ideas and the materiality of form, Zharotia favours making and teaching art through a ‘processual’ engagement, rather than following conventional formats. Repeatedly exploring selected themes, Zharotia’s oeuvre shows his ongoing interest in experimenting with a variety of mediums: drawings, printmaking, terracottas and only recently,with acrylics on canvas. Working earlier within a relatively small format with a largely monochromatic palette, Jai has suddenly exploded as a vivid colourist and is working on large canvasses. His early years were spent working for the Patriot magazine, where he developed a wry and sharp sense of humour that was used as political comment,especially while illustrating poems and short stories of contemporary Indian as well as foreign writers likeNirmalVerma and Bertolt Brecht. This experience of parodying a situation through his skilled pen and ink delineations won him a growing audience, becoming a part of his expression as a whole. It was around this time that Jai evolved a protagonist in his work – a clown-like figure replete with a clown’s cap that sometimes resembled a dunce cap! This figure was Jai’s visualization of the common man – a kind of Charlie Chaplinesque figure that he used repeatedly, till he arrived at a new version of the male clown. This was a female contortionist or acrobat. Bending herself in impossible ways, she appeared as a spineless creature who spun around, sprung up in the air – graceful, supple, charming and totally abandoned. Able to achieve daredevil feats, she defied the system, her manner of survival being both celebratory and dancelike. Which brings us to Jai and music. It is undoubted that Jai’s works are visual equivalents of Japanese haikus and that his sparse use of figures on a flat coloured ground are the equivalent of musical notes that hang isolated in space, each having their own beauty and aura. Many critics have noted the influence of Jean Miro, Kandinsky and Paul Klee on Zharotia’s work, making one realize that trends in Indian contemporary art have drawn sustenance from both their own, as well as international traditions. In his most recent solo exhibition held at Art Heritage – titled Chaos, Mischief, Order, Harmony – his acrylic paintings dismantle the idea of power and authority attributed to “masculinity”. Instead, we see a certain tenderness of gesture and form, mischief making and childlike curiosity, visualized through careful spatial placement of human, animal and inanimate objects. Zharotia’s journey as an artist, emerging from extremely modest roots and finding artistic success is quite extraordinary. He remains true to his tradition and culture while experimenting with a modernistic approach to art making. Jai Zharotia has participated in numerous prestigious group shows and workshops in India and abroad and has had more than 25 solo shows across the globe. 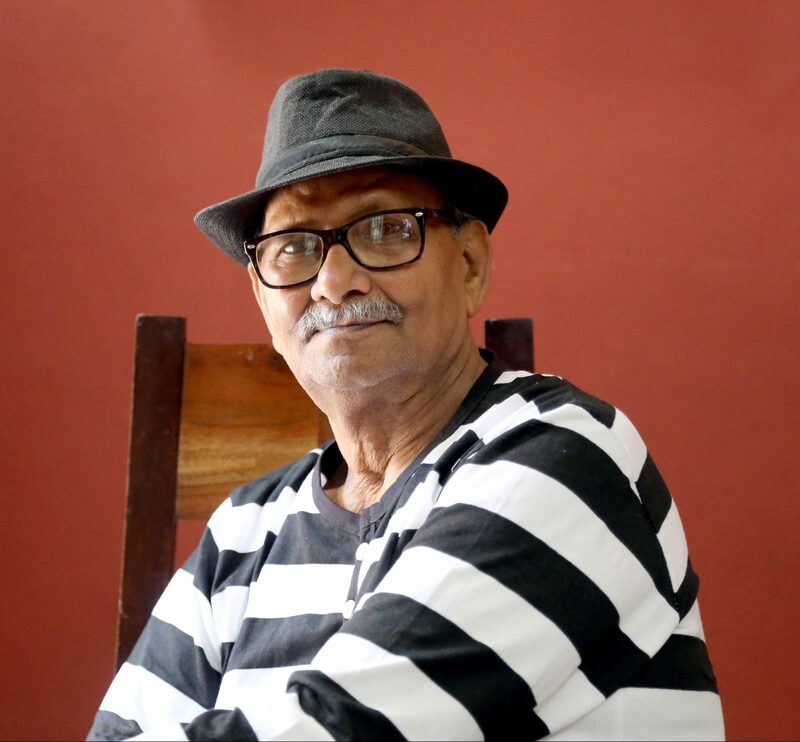 Zharotia has received several awards: two Sahitya Kala Parishad Award, 1979 & 1980; Silk Screen Prints Award date; AIFACS Award, 1987, (Ceramics and Drawing); Lalit Kala Akademi National Award, 1993. Jai Zharotia’s paintings have been acquired by institutions and private collections in the country and outside – Alkazi Collection, KNMA Collection, DAG Collection. Jai lives and works between India and London.